Edward Snell's trip to Australia was well-timed and his versatile skills made him a success. His keen eye for detail and writer’s ear for dialogue make him one of the most compelling diarists of the goldfields. 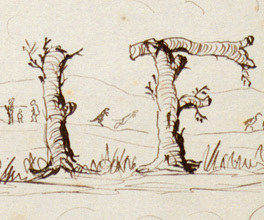 He collected his sketches and thoughts in a diary entitled: 'The life and adventures of Edward Snell from 1849 to 1859'. Snell, E 1988 The life and adventures of Edward Snell: the illustrated diary of an artist, engineer and adventurer in the Australian colonies 1849 to 1859, edited and introduced by Tom Griffiths with assistance from Alan Platt, Angus & Robertson and The Library Council of Victoria, North Ryde, N.S.W. Bob brought down another load at night with the intelligence that Tom had been out at 12 o’clock on Sunday night robbing another person’s hole. If he cuts these sort of capers I hope he’ll be caught at it and then his life won’t be worth twopence at the diggings. Diggers formed teams to share the risk, costs and labour of gold mining. Tom was eventually encouraged to leave the diggings by his fellow team members. They were doing well enough to each give him a pound (450 grams) of gold as compensation. In a stint of about four months, Snell’s share of the team's gold was 102 ounces (2.9 kilograms). He exchanged it in Melbourne for £360; the equivalent of a teacher's annual salary at the time. Snell's experience working in foundries in England, along with his artistic talent, led to his successful tender for the position of Engineer of the colony’s first major railway line. The Geelong and Melbourne Railway Company promised an increase in shipping for Geelong and a new era of fast, comfortable transport for passengers. During the years of design and construction Snell also married and had two children. The railway had the misfortune of a fatal accident on its first run. The company's superintendent - and a friend of Snell’s - was struck when leaning out of the train's engine as it approached a tunnel. An inquiry cleared the company of any negligence. But the first trains were also slow and the decision to only lay a single track was short-sighted. High maintenance bills affected profits and passengers still preferred to take the ferries across Port Phillip Bay. Perhaps sensing that a cloud was looming over his role in the railroad’s design (for which he had been paid more than £19,000), Snell decided that it was time to return to England. He continued a successful career in design and architecture and died in 1880. Water and gravity were used to separate gold from dirt in the early days of the gold rushes. Victoria’s sudden riches caused as much anxiety as celebration. News of Victoria’s good fortune spread throughout the world.